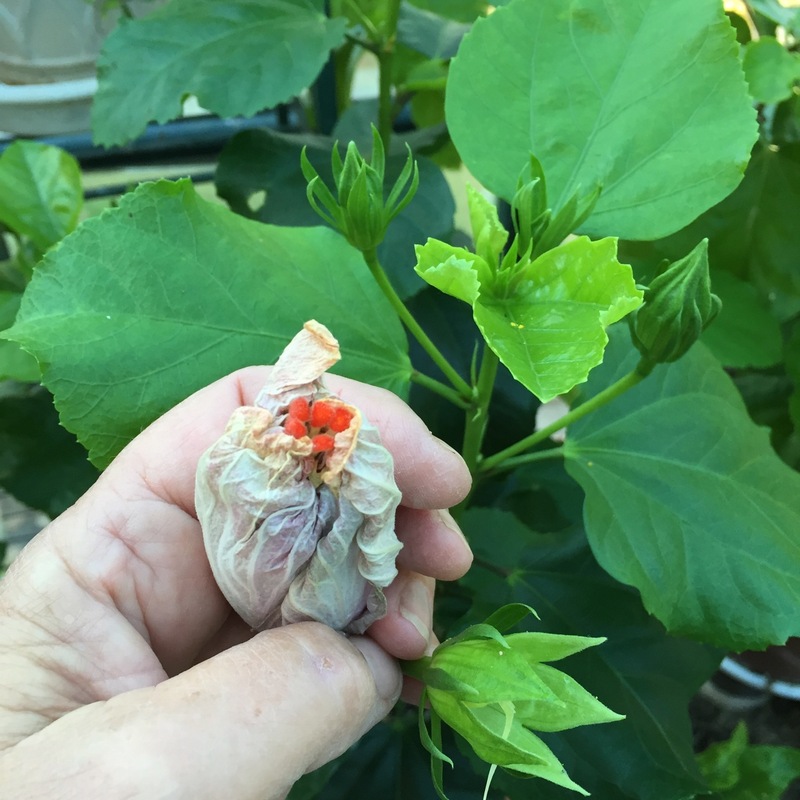 Hibiscus sinensis "Creole Lady" had had a tightly furled reddish bud for about a week. 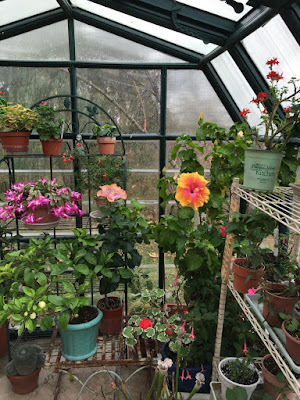 I couldn't get down to the greenhouse for a day, but it was drizzly and cool and I knew things would be fine in there. Well, Lady was gettin' busy in the greenhouse. If only I'd known!! The next day I opened the door and walked in to find this. What is different about this picture? 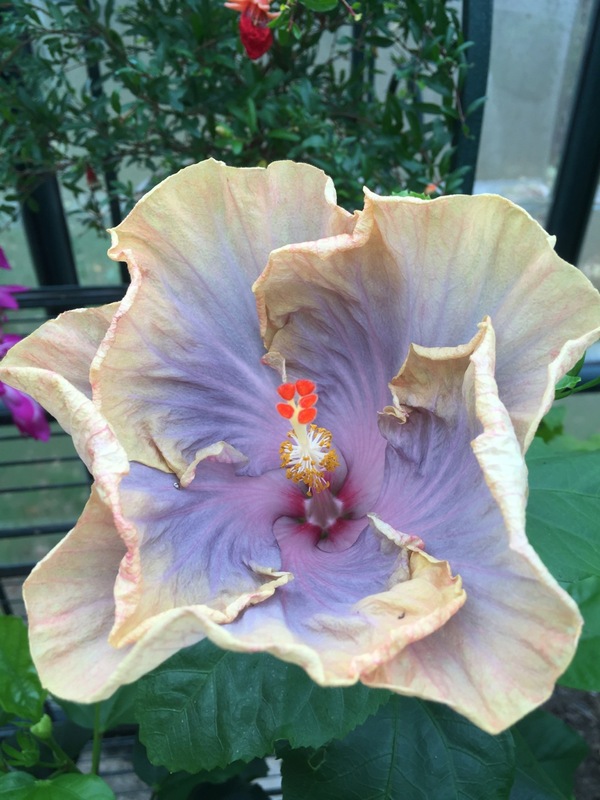 It might be the huge sunset-hued flower that has opened. She'd been open for a day, and I missed it!! I made a noise like OOP! The kind of noise you'd make when you were a little kid and the Jack-in-the-box popped out. I never got used to that; they still scare the crap out of me. Clowns and all that. But this was a happy OOP, a wordless expression of utter amazement, shock and awe. 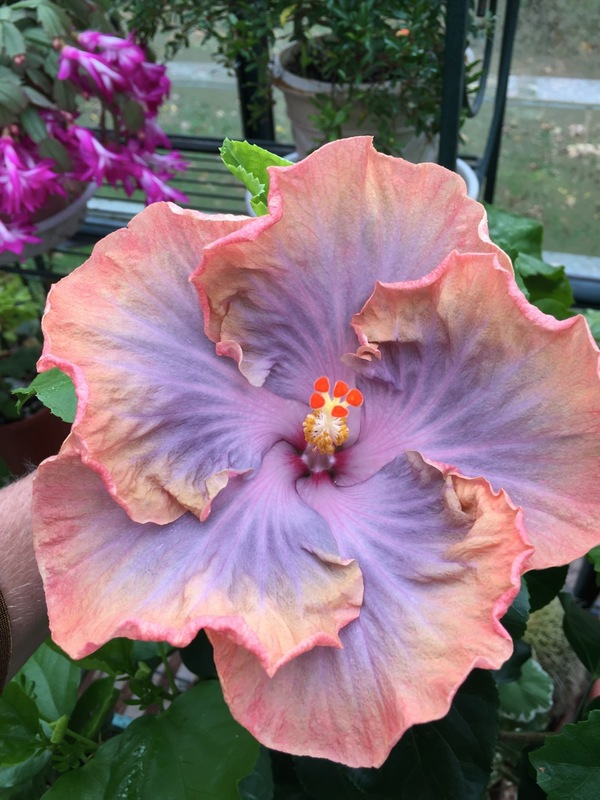 How do they breed a flower like this, that looks like a Daytona sunset? How can every color I adore be combined so gracefully in a single flower? 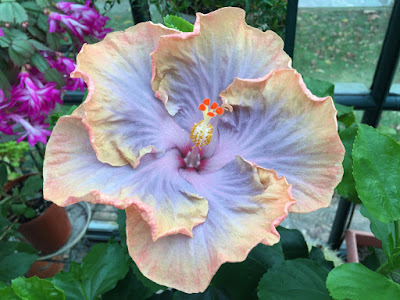 And with a red-orange stigma floating above the whole creation? Come here. Let me look into your face. I have completely quit using photo filters like Snapseed or any of those offered in Instagram. In my opinion, nothing can compare to what the iPhone 6 is able to see. It sees what I see, pure unadulterated beauty. You'd swear I'd messed with this, filtered it, but no. 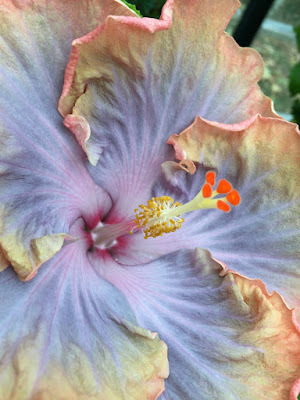 This is Hibiscus "Creole Lady," just as God and man made her. Swoon. For make no mistake, she is a creation of man, and man's creations can be pretty darned wonderful. 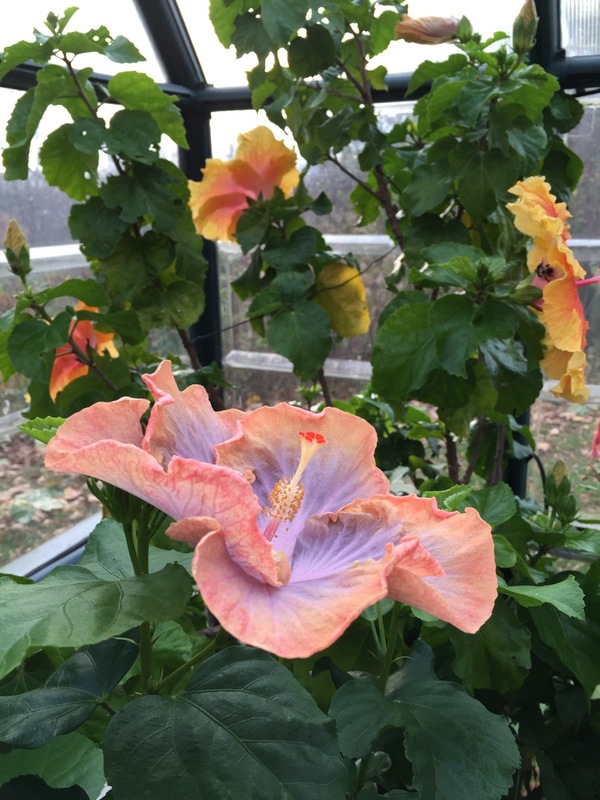 Not sure why they call these "Cajun" hibiscus--perhaps they were first bred in Louisiana? But I love the names..."Voodoo Queen" is another one I have my eye on...She changes color from day to day! Aggh! I'd never leave the greenhouse! I moved her closer to her big sister "The Path." I had to leave for town in a few minutes. Man, I hated to leave that flower. I wanted to brew a cup of orange spice herbal tea, add honey, and sit down and gaze into her face, then into The Path's, then into hers, for a couple of hours. 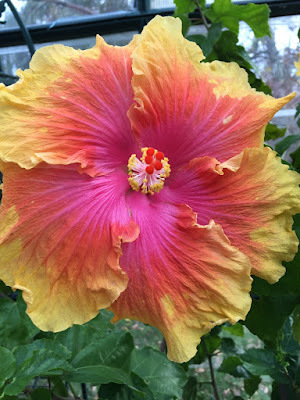 I wanted to write poems about hibiscus flowers. I wanted to do a watercolor, right there on the spot, see if I could somehow make Cobalt Violet and Winsor Yellow and Permanent Red with a touch of Chinese White swirl and blend and behave impeccably, the way her colors do. I knew I couldn't, but I wanted to try. But I had to go. And when I came back it was dark, and the next morning she looked like this. If I hadn't seen her the day before I'd still have been enchanted. The paler colors made the stigma even better. Yes, I'm goin' all Georgia O'Keeffe on you. I'm in LOVE. And the next day, Lady was folding in on herself, and a verse from Maurice Sendak came to me. Oh no! Please don't go! We'll eat you up, we love you so! But Creole Lady had to go. Waving her orange stigma all the way. She has plenty more fabulous flowers up her sleeve. Buds a poppin' all over. And bonus! She's a three-day hibiscus, like her sister. More joy for all. (Most common hibiscus flowers last but one day, then fall). my greenhouse froze on November 23, 2013. Everything about Donna's gesture was perfect. 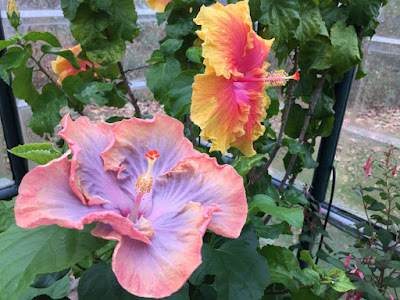 The name, the brilliant, rousing color of the flower, the plant itself. Big, bold, strong, a party girl! She helped pull me up out of the depths of despair after every plant I loved died so cruelly that night. It wasn't instant. But it worked. I have kept and loved many hibiscus plants over the decades. But these are works of art, another level of horticulture altogether. 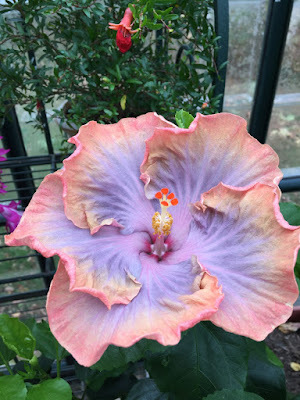 I'll never be able to go back to plain single hibiscus. Spoiled. I deserved such a plant, and Donna showed me that. I laugh when I see "The Path" yelling out the back window of the greenhouse. THERE'S AN AWESOME PARTY GOING ON IN HERE!! She makes me grin real big. In two years, she's grown to be as tall as I am. It's nothing for her to throw six flowers at once now. Aggghhhh the joy. I'm not the only one who loves her. There's a bumblebee who has been sleeping in my greenhouse on cold nights. This morning I woke her up taking photos, and she did a little set of bee yoga. Upward bee! Stretch those legs! She visits all the flowers in the greenhouse, then flies out to forage when it warms up and I open the door. 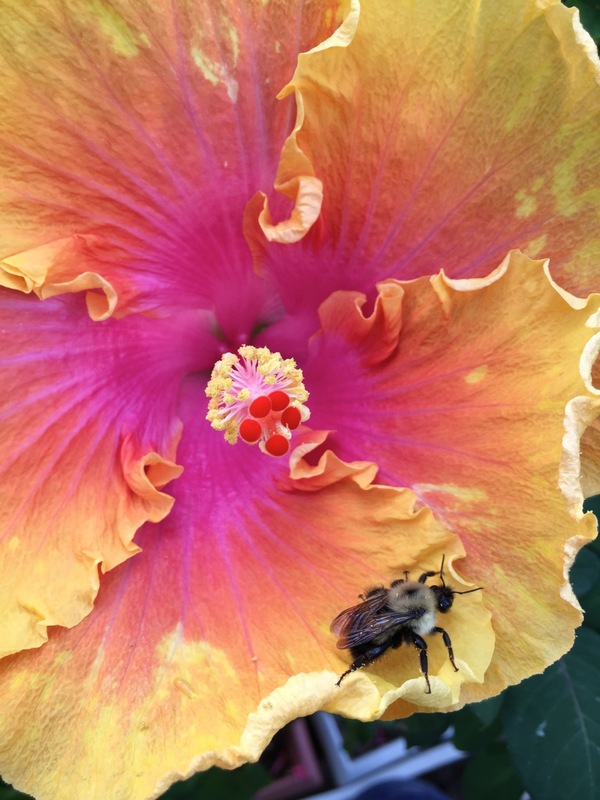 It's good to know a bee, to offer her safe harbor in cold weather. It's good for both of us to have this place for our retreat. It's good to have The Path and Creole Lady to talk to. You are killing me. I HAVE to get on of The Paths. Wonderful and yes, please, go all Georgia O'Keeffe on us! 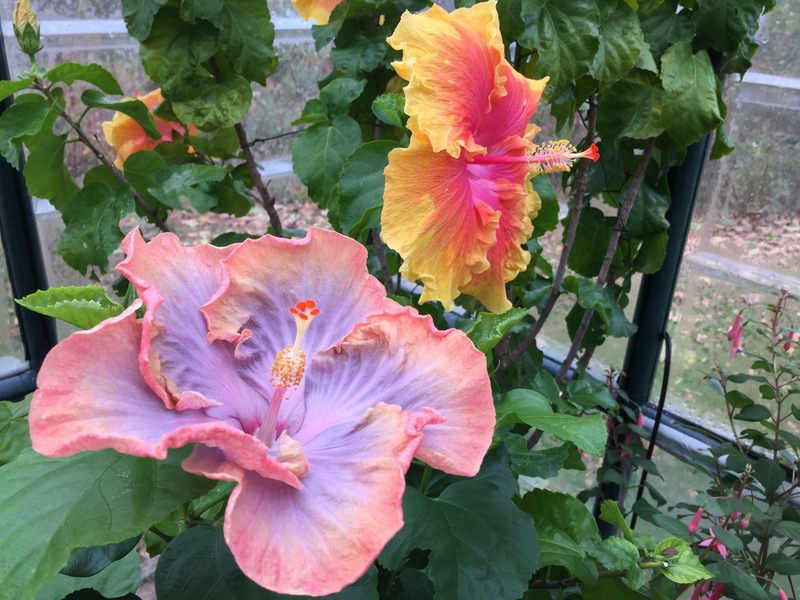 What's the diameter on these flowers? They look to be huge. So beautiful. Thanks for posting. Speechless...just now. What can I say. Wow. That doesn't even begin to cover it. 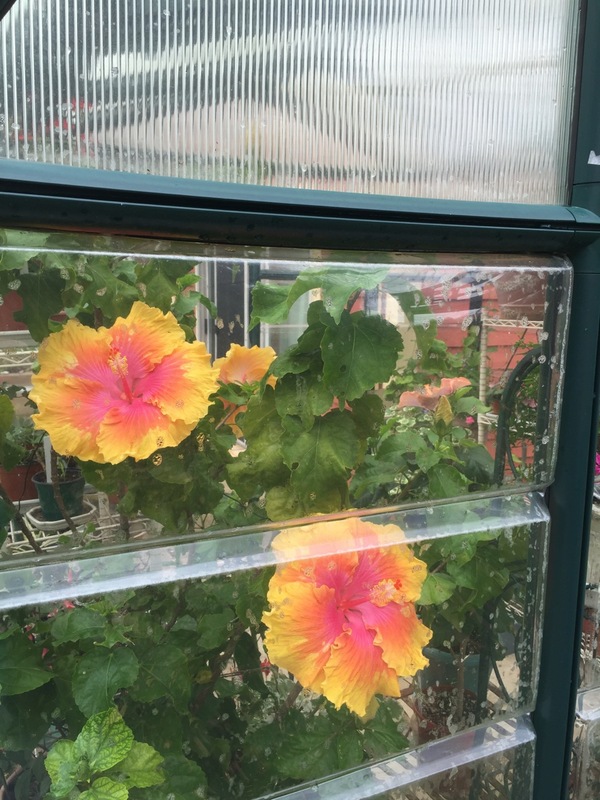 You need a camera permanently mounted in the green house snapping a photo every hour so you don't miss something. 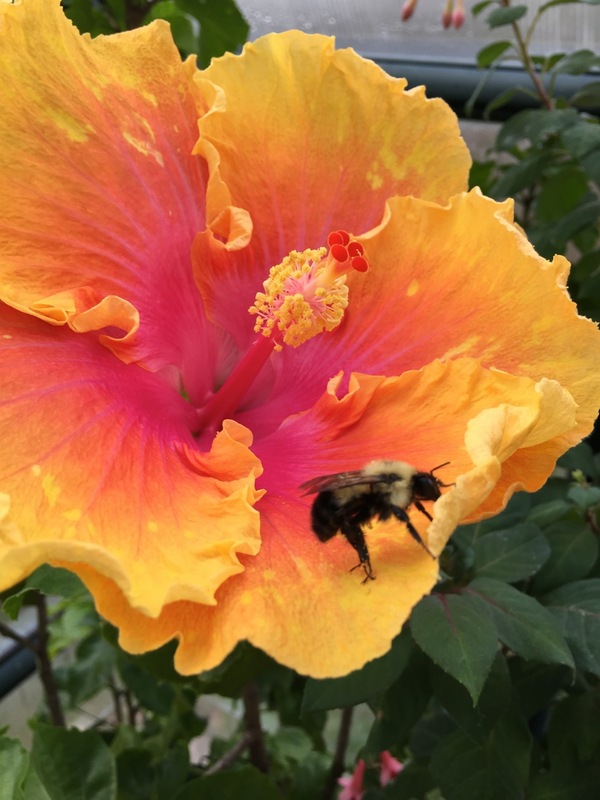 Love love love the crafty bumblebee! 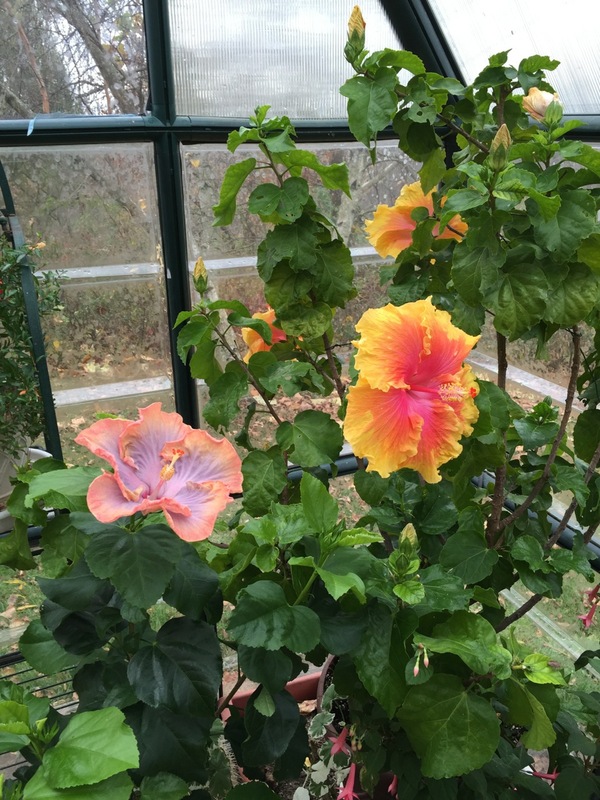 I love seeing the beautiful blossoms you tenderly nurture in your greenhouse. You capture a bit of summer in every bloom. Bravo! Beautiful! To get here, I had to click on "view previous comments" several times to get the link to come up, and then when I clicked on the link, my computer went blank and brought up the message "this page not available," but I waited there a few seconds, and suddenly there you were! Glad I found it! What beautiful friends you have. I love that you think of your plants as friends. I too think this and have had some odd looks when I speak of them in this way. It looks as though Mardi Gras is happening already in your greenhouse. May the party rage. 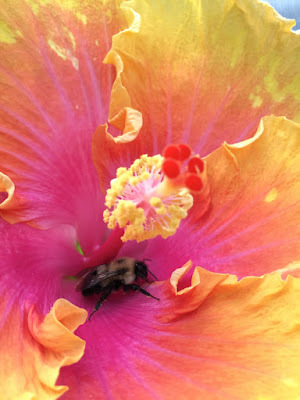 Though the 'biskies took my breath away, the little bee made me smile. I came across them dozing on our wildflowers just after sunrise, sleeping off their nectar debauchery of the day before all summer long. After a few years of not seeing as many bees, I was overjoyed to have them back again. Wow. I wonder what she looked like the first day she bloomed? I can't even imagine!